With the Easter holidays coming up, we decided to hold a limited time promotion for you pClouders out there. For the upcoming week, you can get a combo pCloud Premium and pCloud Crypto subscription at an egg-cellent price! Easter is great, I believe no one can argue with that! It’s the best excuse to slack for a few days, stuff yourself with overbearing amounts of chocolate, and refresh your profile with photos of colorful eggs. And if you’re on the more adventurous side, it comes with the perfect weather to grab your suitcase and make some memories with your loved ones. Among the list of amazing things Easter brings, are the amazing egg designs and great family memories. That’s why we got you covered with 500 GB for all your photos and videos, and the unhackable privacy that goes with that. 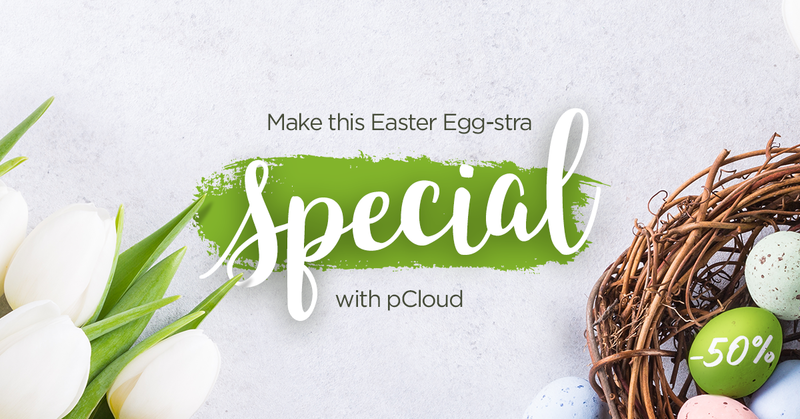 Now, you can add one more thing to the list that makes Easter great, and that’s pCloud! With the pCloud team celebrating Easter, starting from today, if you subscribe for both pCloud Premium and pCloud Crypto you’ll get a 50% discount. pCloud Premium brings a lot of great perks that makes your digital collection ready and available, wherever you go. You get 500 GB of cloud storage at your disposal, along with new easter egg features like pCloud Rewind, Password- protected links, Screenshot sharing, RAW file preview and a lot more. What’s even better: pCloud Premium comes with 500 GB of download link traffic per month (this is the traffic generated when other users stream or download content, shared by you in a public download link) and unhackable security for your private files with pCloud Crypto. 1. This a limited time promotional campaign active for 7 days only, until the 21st of April, 2017 , organized and run by pCloud AG. 2. This promotion gives users the opportunity to purchase a bundle containing pCloud Premium and pCloud Crypto at a reduced price as follows – $4.99/mo or $47,88/annual. 3. Тhe indicated promotional prices are only valid in a bundle of pCloud Premium and pCloud Crypto and are not applicable if your only purchase one of the two services. 4. In order to participate in the promotion, you must sign up for a Free pCloud account or log in to a Free pCloud account through this promotional page. 5. Тhis promotion is NOT valid for existing pCloud Premium, pCloud Premium Plus or pCloud Crypto users. 6. Once you sign up for this promotion, the reduced prices will be applicable until you choose to cancel your subscription. 7. If you cancel your subscription and decide to renew it, later on, you will no longer be able to take advantage of this promotion. 9. By participating in the promotion, participants agree to pCloud’s general Terms of service. 10. Money-back guarantee is allowed only within the first 10 days, following the purchase date. After this period expires, accounts are not subject to any payment refunds. 11. pCloud AG at all times reserves the right, at sole discretion, to deny promotion participation to any individual.